Rebuilding your life after divorce is a scary and sometimes overwhelming process. So much has changed and you’re probably struggling with a lot of negative emotions. The good news is that you won’t always feel this way and you will eventually move past all the drama of the divorce. But in the meantime, the following article can help you understand why it’s so hard right now and what you can do about it. After divorce, women often experience greater loss and tend to get depressed more than men. It’s harder for them to move forward with their lives. Find out why and how to let go and get your life back. In general, women tend to become depressed more than men. Ten to 25 percent of women experience depression, and divorce doubles their risk. For women, it’s a huge health problem, second only to heart disease. Divorce is harder for boomer women, because they become unhappier than men as they age. Women constantly compare their looks to others and media models, which undermines their confidence and self-esteem and makes them anxious about aging and being desirable. Chemistry: Our brains produce less serotonin and more cortisol than men, which contributes to depression. Mood swings in menopause also heighten the risk for depression for boomer women. Coping style: Studies show that assertiveness, self-efficacy, and autonomy lead to greater self-esteem. If instead of being assertive, you suppress your anger, you’re more subject to depression. Men are generally more autonomous than women; more career-focused, and can easily concentrate on accomplishing goals. They have better coping skills and can distract themselves from pain. After divorce, men tend to throw themselves into work, whereas women find it difficult to take action and do more grieving. The more independent and assertive you are, the less depressed you’ll be. Priorities: The main reason most women take divorce harder is because we’re wired for connection. Relationships are the priority, and attachment loss preoccupies us more than anything else. Even a breakup with someone after six months of dating can be devastating. If being a homemaker was your priority, you lose not only your husband, but also your identity as a wife and homemaker. It’s daunting to enter or re-enter the workplace, especially after 50, when you’re competing with energetic college grads. Divorce is especially hard for single mothers and those struggling financially. How long is it okay to cry? Daily mood swings are common. Crying is not only okay, but necessary. Tears spill when the heart is too full. It’s perfectly normal to feel anxious, angry, depressed, rejected, helpless, and incompetent, and the older you are and the longer the marriage, the more these feelings intensify. Sometimes, there’s more anger than grief. Anger helps couples separate. Just beware of signs of depression, which include: feeling sad, tired, irritable, worthless, or guilty. You may also find yourself crying excessively, feeling indifferent about your usual activities, having difficulty concentrating, withdrawing socially, and experiencing changes in your appetite, weight, or sleep. Seek professional help if you’ve had these symptoms more than a month. Studies have shown that the second year can feel worse than the first. Sometimes there’s an initial feeling of relief or freedom, and reality and loneliness don’t set in until year two. In most cases, by 18 months, negative feelings peak, and people start to adjust to their new lives. What is the most common mistake women make? The biggest problem for women is negative self-talk. It can bury you and turn sadness into hopelessness. Women are highly self-critical. It starts in childhood and leads to low self-esteem, guilt, and shame. Self-criticism and the “should haves” totally undermine self-esteem and happiness, and can immobilize you with doubt, fear, and guilt. Without realizing it, they can make you feel in the dumps. Pay attention to your words and notice how what you say to yourself. Generally, by three years both men and women enter into new relationships. Yet, sometimes there’s unresolved guilt, resentment, or sadness toward a spouse that get buried and can linger for years if not worked through. Why do some women recover and others don’t? Again, having a career or goals helps. If the marriage ended because of your husband’s infidelity, it recovery is more complicated, because you’re not only grieving the end of the marriage, but dealing with feelings of betrayal. If the divorce wasn’t your choice, it also takes longer. Holding on often occurs because there’re unresolved abandonment issues from childhood that haven’t been dealt with. I’m referring not only to physical abandonment, but to emotional abandonment, which most people don’t think about. If you had a depressed, addicted, or narcissistic parent, you’ve been emotionally abandoned. Recovery will also stall if the un-bonding process isn’t completed, because the emotional marriage continues. 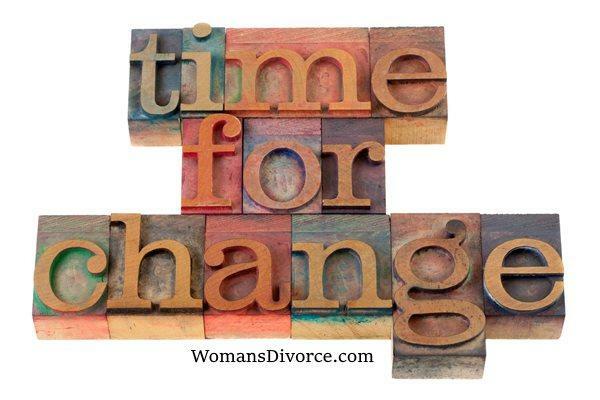 As discussed more extensively in my article “Growing through Divorce”, to unhook, it’s important to really look at your patterns, and change them. An example is a woman who had played a very maternal role with her husband continued to be his confident after they split. She still loved him and felt loved in return because he said she was his “best friend,” even though he was involved with and loved someone new – someone who wasn’t mothering him. His ex-wife hadn’t unbounded or worked through her negative pattern that actually had led to their divorce. What kind of support is advisable? Support is essential in moving on with your life after divorce. Friends are an enormous resource. Ask them to sign up for a class with you or to regularly schedule walks or meet-ups. Just beware of anyone who gives you a lot of unwanted advice or judgment or pressures you to “let go,” without actually being supportive and encouraging. This is an ongoing part of creating a single life after divorce that includes activities, not just talking on the phone. You don’t have to do everything alone. Ask friends to accompany you to doctor and lawyer appointments, and help you pick out furnishings, pack and unpack, and find an apartment. What’s the best way to manage feelings? Managing feelings is a combination of allowing them, but not dwelling on them. Acknowledge your feelings by saying “I’m sad, or angry, lonely, or jealous,” and let yourself feel the emotion completely. Feel, but don’t obsess and get into the story in your head. That’s the best way to release. When you’re feeling blue, nurture yourself with things and activities that feel pleasurable. Take action. Change the scene, take a walk, reach out to friends, cook a meal, do something creative, meditate, journal, exercise to boost your serotonin, socialize, and show up for a class – even if you don’t feel like it. A positive example of taking action is a woman who poured her emotions into her art and became a successful artist. One thing that helps (really) is to write yourself a love letter. The following are important steps that will help you let go and move on. They’re not always easy to follow, but if you make an effort to do so, you will see results. If you have trouble with any of these steps, it’s a good idea to get professional help. Psychotherapy can be an enormous support in moving on and changing your patterns. Find your passion and learn something new about it. Take action! Establish new, clear boundaries with your ex. If you’re tempted to call, don’t. Call a friend instead. Accept reality. Now that you’re divorced, you alone are responsible to create your own happiness. You may not like it, but acceptance is key to moving on. Don’t judge yourself, but be kind to yourself, and plan activities that you enjoy.